The sloping garden features colour from late August till June with an extensive salvia collection, roses, bulbs, iris, perennials, exotic and native trees and shrubs. Garden structure and design utilises rock walls, archways, shaded retreats, art works and rambling paths. 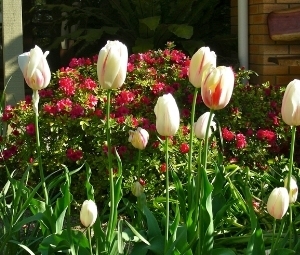 Visiting groups allow us to continue to improve the garden and consequently hold a charity Open Garden most years for two local hospitals and Cancer Council Victoria. We do not aim to make a personal profit. If you would like to visit, please call or email at least one week in advance to ensure we will be home. $10 Entry with catering extra. Call on 03 5766 6275 or email us with your enquiries. Birchwood is open for garden visits and Special Occasions from September through to June 1st. Weddings are welcome. Small or large groups find Birchwood ideal for social outings. $10 Entry. Afternoon Tea or Lunch according to requirements discussed when booking is made. Overnight Accommodation is by email or phone bookings 7 days-a-week excluding Christmas and Easter Public Holidays. Make an appointment to preview the garden and to discuss the details of your special day with us.